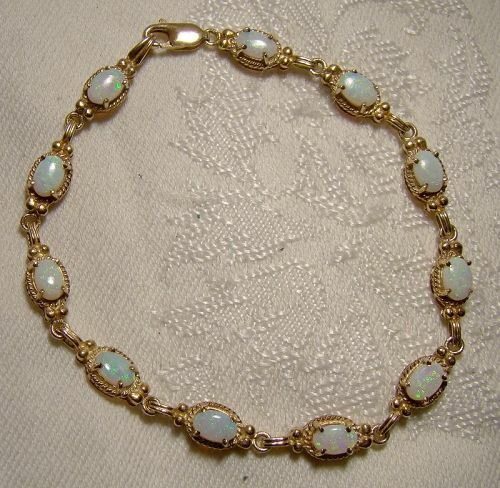 A 10k yellow gold opals tennis bracelet with lots of colour circa 1970s. This lovely 7-1/2" long and 1/4" wide bracelet features 11 flashy and colourful genuine 1/4 x 3/16" natural opals with intense blue, green and orange fire. It has a lobster claw clasp, it weighs 7.1 grams and it is stamped 10K with an F in a diamond maker's mark. It is in excellent condition with no chips, cracks, dents, bends, corrosion, damage or repairs. All items are thoroughly and conservatively graded and all condition issues are noted; all items are vintage or antique and may have slight signs of gentle use. Expedited tracked and insured parcel shipping to the U.S. starts at $27 (other spots may vary, air is higher). Items paid with a credit card will be shipped to confirmed addresses only. We do ship internationally. All of our prices are in $US. PLEASE NOTE: We DO NOT accept PayPal.